I have a set of compute tasks I want to schedule, these tasks have dependencies and a task may not be executed until all its dependencies are executed. The current scheduler ensures correctness, and capable of culling unneeded tasks such as k in the previous graph (assuming the end goal is i). The idea here I want to fill the compute engine with as much work as possible. From your initial DAG $G(E, V)$ You start reversing all edges to build a new DAG $G'(E, V')$. Then do a BFS from $i$ in $G'$ to remove any unneeded tasks (unreached nodes in the BFS). This step is $O(N)$ with $N = |V'|$, the number of edges. From $G$, build the number of requirements of each task ($R(V)$) and at the same time the list $L$ of the tasks with no requirements. this takes $O(N)$. Not the answer you're looking for? 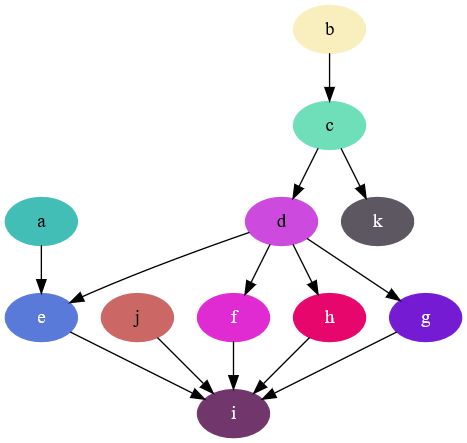 Browse other questions tagged graphs graph-theory . Is there a faster algorithm for my graph problem? How to partition a digraph for later parallel computation?